Year of the Pig 2019 : a year of fortune and luck! The Pig occupies the last (12th) position in the Chinese Zodiac. You are a “Pig Chinese Zodiac native” if you are born in one of these years: 1935, 1947, 1959, 1971, 1983, 1995, 2007, 2019 . According to the chinese astrology , 2019 is a great year to make money, and a good year to invest! 2019 is going to be full of joy, a year of friendship and love for all the zodiac signs; an auspicious year because the Pig attracts success in all the spheres of life.  Rat - A year full of happiness and prosperity!  Ox - A good year for Ox. A time with good opportunities to make money.  Tiger - Born in a strong and independent zodiac sign, as a general rule, you do what you please. This year through, you will need to learn how to come to terms with others.  Rabbit - An excellent year is waiting for you! A bit less wary than usual, you will easily get close to others and make new friends.  Dragon - For you, the impact of the Pig’s calmness will mean a year of reconsiderations.  Horse - The year of the Pig 2019 is going to be more auspicious than the Dog Year 2018 !  Goat - A 2019 year under the mark of chance, when all your ambitions will be fulfilled .  Monkey - A year under the influence of chance !.  Rooster - This year you need to actually pay attention to the quality of your relationships with others, if you want to succeed.  Dog - This year count only on your own efforts in order to succeed.  Pig - The year 2019 is yours, right? Start by setting your priorities and then get to work: once you start moving, you will start seeing results. In 2019, the ruling Tai Sui is Xie Tai. 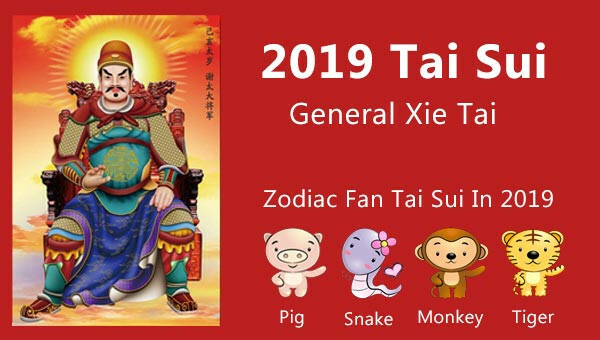 In the year of the Pig 2019 the position of Tai Sui is at North West 3. 2019 Feng Shui remedies for maintaining a good relationship with Tai Sui in 2019 : Place a Pi Yao statue in the southeast to prevent the bad luck and the illness Tai Sui can attract, in case the above mentioned rules are not respected. In chinese astrology, bracelets and figurines with pigs containing different crystals, are also considered lucky in the Year of the Pig 2019. For those who wear them, the Pig ensures a constant, high income, abundance and prosperity. It is also an excellent Feng Shui present for those who wish to change their job and to obtain a “fatter” pay. Does it mean we need to pray to tai sui if any of our bazi character clashes with the pig? Tai Sui(The Grand Duke) is always in the direction of the branch at Year Pillar. So next year will be Zi Rat etc. Some avoid that direction completely, others use cures and move them every year etc. If I remember correctly we avoid that year for date selection in XKDG if it comes as a sitting direction for the house. In any case, traditionally Pi Xiu is used to guard that direction as far as I know. Again either the direction itself or the opposite one depending on the school(often its both).